Short Business Description: OUR BRAND MIRA WEDDING HAS THE KNOWLEDGE AND EXPERIENCE OF MANY YEARS, OUR GORGEOUS DRESSES COMBINED WITH THE COMPANY’S REPUTATION FOR QUALITY AND SERVICE. 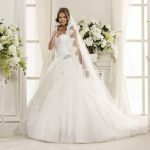 Our brand Mira Wedding has the knowledge and experience of many years, our gorgeous dresses combined with the company’s reputation for quality and service. We offer the best and most comprehensive service, reasonable price policy without any compromising on quality. Our team is working for your fairytale wedding day.